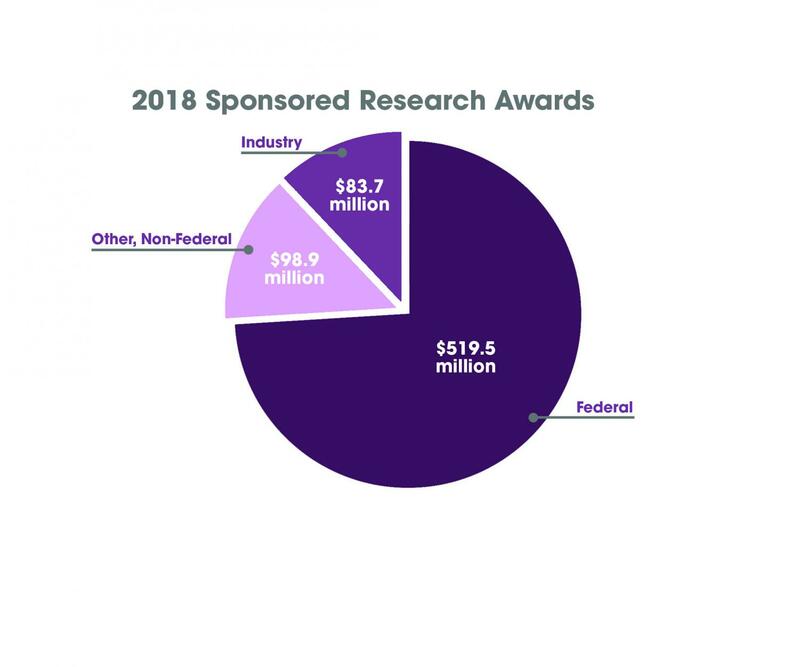 Northwestern’s sponsored research funding increase in the past decade can be attributed to the school’s “culture of excellence” and a decision to invest in research infrastructure during the Great Recession. Northwestern continued its trend of sponsored research funding growth last fiscal year after receiving $702.1 million, the highest amount granted to the school ever. Federal government awards grew 12.8 percent to $519.5 million total, according to data from the Office of Research. Awards from industry shrank more 26.6 percent to $83.7 million, while other non-federal awards declined three percent to $98.9 million. The trend can be attributed to the school’s “culture of excellence” and a decision to invest in research infrastructure during the Great Recession, said Jay Walsh, vice president for research. Andrew Ott, director of Core Facilities, said in an email that Northwestern’s research infrastructure is unique because of its emphasis on collaboration and its financial resources. With a research office that guides faculty through complicated procedures for securing funding, researchers can focus on working on their topics instead of bureaucratic technicalities, Walsh said. Faculty requested more than $3 billion of grant money through the Office of Sponsored Research last fiscal year, which concluded at the end of August. Feinberg Prof. Marcus Peter said he was “very privileged and happy” to have received a grant from the National Cancer Institute in 2015. With the funding, he and his research team recently discovered that nature’s answer to cancer — a sequence of toxic nucleotides in RNA — exists in every cell, which could revolutionize cancer therapies. Northwestern’s historically strong financial position allowed it to expand its research operations during the Great Recession — it constructed buildings, hired faculty and bought equipment at lower costs than normal during that time, Walsh said. Thus, Northwestern’s research funding has increased around 60 percent since 2008, even as federal funding has remained flat and other universities haven’t expanded as much, he said. “We were expanding when everyone else wasn’t, so we’ve gone through a significant expansion in the last 10 years,” Walsh said. By comparison, Harvard University’s sponsored research funding grew 24 percent in the same period, from $714 million to $885 million. Of the $702.1 million granted to NU, the majority — $484.6 million — went to Feinberg, which Walsh said is typical. The majority of accepted research grants comes from the National Institute of Health, which increased 13 percent last fiscal year. Still, the money doesn’t come without preconditions. Sponsored funding often comes with restrictions and compliance regulations, Walsh said, which helps the federal government and companies keep track of what happens with their money. Just as the Office of Sponsored Research helps faculty apply for grants and secure funding, the Office for Research Safety, helps faculty comply with regulations. Walsh said he doesn’t think regulations deter researchers. Regulations are more analogous to traffic laws, which create an environment where someone can safely drive, he said. Similarly, regulations create an environment where faculty can safely research. Even as President Donald Trump and acting EPA administrator Andrew Wheeler aim to decrease federal science funding, Walsh said he doesn’t think NU’s sponsored funding from the government will falter. An omnibus bill Trump signed this March marked significant increases for federal research funding, according to a report by the American Association for the Advancement of Science. Walsh said he expects research funding to continue growing in the future. A previous version of this article misstated the year Feinberg Prof. Marcus Peter received a grant and the name of the organization. He received the grant from the National Cancer Institute in 2015. The Daily regrets the error.